Aquamarine Gemstones are actually one of my favourite stones given their relative availability and the fact that they are way more transparent and free of inclusions as compared to Emerald. However, you may not be aware that Aqua is ‘Beryl’ and is actually from the same family of stones as Emerald but takes on a more ocean green-blue color that we all know and love. For those of you that are gemologically inclined, the stone has a hexagonal crystalline structure and a vitreous lustre and is easily identifiable under a microscope. Aquamarine is the birth stone for March and is in fairly strong demand both for collections and to be placed into retail jewellery which means that there are plenty of lab created and synthetic stones doing the rounds that you need to be careful to watch for. Firstly, color wise, most real Aqua’s will never be darker than Swiss Blue Topaz and if the color presents in this manner then it would be worthwhile to get the stone certified at a GIA lab somewhere. However, there is one exception to this and that is the Maxixe Aqua Marine which takes a relatively dark color saturation to the next level and is easily recognisable when compared to normal Aquamarine. Maxixe stones have actually been enhanced with radiation which typically gives it the characteristic deep blue color but the problem with these gemstones is that they are not stable and your beautiful blue color will fade over time. You can also identify these pieces by their abject lack of pleochroism (meaning the gemstone exhibits multiple colors) which is a fairly standard feature of normal Aqua. Additionally, they are also not worth the same money as untreated Aqua so be very careful approaching a purchase such as this. If in doubt…always get the seller to send you fresh pictures and if it’s too dark then pass. Most of these Beryl based gemstones come out of the ground with tinges of green which can subsequently be removed by heating the Aqua to approximately 375 degrees C. This removes the green and leaves us with the ocean blue that we all love. 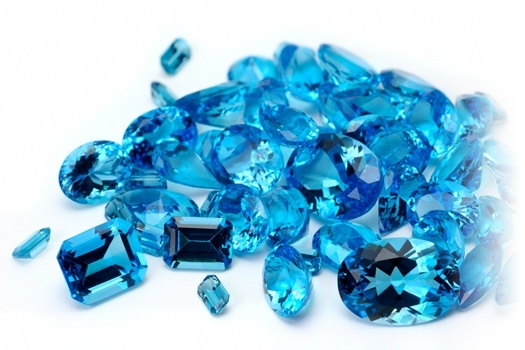 Aqua is routinely heat treated and this isn’t something that really impacts the price too much and so most people just assume the gem has been heated if it has the pure blue color. However, there has been a move lately by some consumers to seek out the stones with a gentle green tinge given that they are untreated and a little rarer. Honestly though, IMHO it doesn’t make a tremendous difference in price and I would rather focus on color saturation and the cut. Thankfully, Aquamarine is subject to a tremendous amount of treatments just yet but the producers are always coming up with new ways to improve gemstone quality. This in itself is fine but it’s important that any retail level seller discloses the treatments to unwary consumers. Otherwise we are faced with a situation where it is difficult to actually know what to pay for a stone given that treatments can change values drastically. This is another reason why we here at gemtoria test our incoming products and alert our buyers to any potentially treatments in an honest and open manner. Pricing a stone site unseen is always incredibly difficult and depends on a host of factors, not least the target market! However, I am publishing some basic values here for what I would consider appropriate in the New Zealand market for top quality examples of faceted Aquamarine Gemstone. So there you have it! Ultimately, sourcing aquamarine online is a process of developing relationships with your potential supplier and asking the right sort of questions about potential gemstone treatments and enhancements. To be 100% sure you really have to see the gem in person to see the color’s and transparency and/or to test with a dischroscope or polariscope. However, most people are relatively honest when asked directly (except for ebay which I recommend you avoid! ).